On Wednesday, March 29, members of the Village Center team from Atlantic Realty Companies (ARC) showed off updates to their plans for the center to about 75 interested residents. ARC Partner and Executive Vice President Adam Schulman addressed the crowd with an update as to the progress so far. Schulman noted that a sketch plan had been filed with the county, and the next step for ARC was a site plan, although they had made one substantial change to the sketch plan—the elimination of the apartment complex and parking garage in the rear of the property. The proposed 212 units would be replaced with a cluster of townhouses, bringing the total unit count on the property down from 299 to 115. Schulman said the decision was based on community feedback that the apartment building was too large for the site. A larger park area was also added. To further accommodate the request for a lower total height, ARC plans to turn the current “Village Quarter” section of the center into flats-style apartments. Rather than constructing new buildings in this area, they are planning a new façade and gutting the interiors, resulting in about 32 rental units. Park and Landscape Architect Omar Syed described the park plans for the site. The open, passive recreation park will be bordered by tree-lined streets, near parking and the shops. All the trees are planned to be “limbed up,” creating visibility at eye-level through the space. One corner will feature a sail canopy and seating, with the opposite corner featuring a monument gathering area with seating. 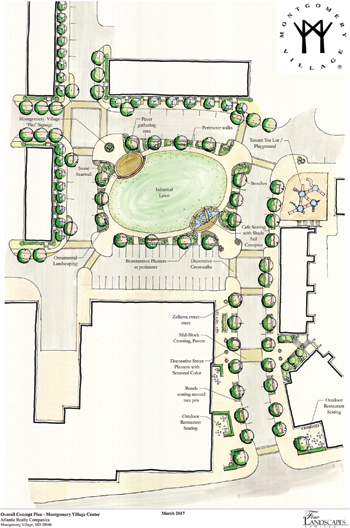 Planters and seating will surround the park with all four corners open for egress. Schulman said ARC hopes to finish the project by spring 2020. They expect the site plan and preliminary plan to be approved in fall 2017, with construction to begin in winter 2018. Phase I of Retail Construction will be internal tenant moves and new pad sites; Phase II (winter 2019) will be the façade changes, a new street and anchor stores. Residential flats are slated for winter 2018, and the townhouses and 2 over 2s are slated for spring 2019. Several audience questions centered around traffic and parking concerns. ARC noted that the streets would be private, and parking would be a mix of the spaces provided and garages for the townhouses. Traffic flow would be improved by the additional cut-throughs of the roads, but because of the reduction in current retail and proposed changes, there would be no overall net change in traffic flow around the site. It was also noted that residential units would be subject to covenants similar to other associations in Montgomery Village, and that both the developer and Montgomery Village Foundation (MVF) are working to make sure unit owners would become members of MVF.